Guest bedrooms should be cosy, inviting, and a haven for a good night’s sleep. As the festive season draws near, this will be at the forefront of our minds. Because we want friends and family to feel welcome when they stay at Christmas. When creating a sanctuary for guests, second only to the quality of your sheets and plumpness of your pillows is decor. It’s the key to making guests feel at home. And typically, guest room interiors are kept simple and neutral, abiding by a universal style that appeals to everyone who stays. Whilst we agree the decor should be enjoyed by all, we don’t believe it should be boring. Why choose safe and bland when you can inspire your guests instead? 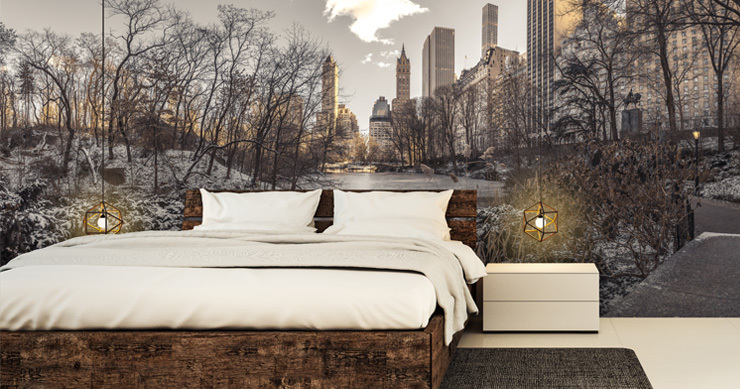 If you want to revive your spare bedroom ready for visitors this Christmas, choose a stylish mural that is both one-of-a-kind and universally loved. Here are some bedroom wallpaper ideas to get your creative juices flowing. Cool greys are a popular colour scheme for guest bedrooms because the palette is neutral enough for every visitor. Young, old, male, female, cool and hip, or behind the times – whoever your guest may be, grey is always well-appreciated. But you don’t have to stick with plain old paint or an outdated wallpaper pattern to keep things balanced. 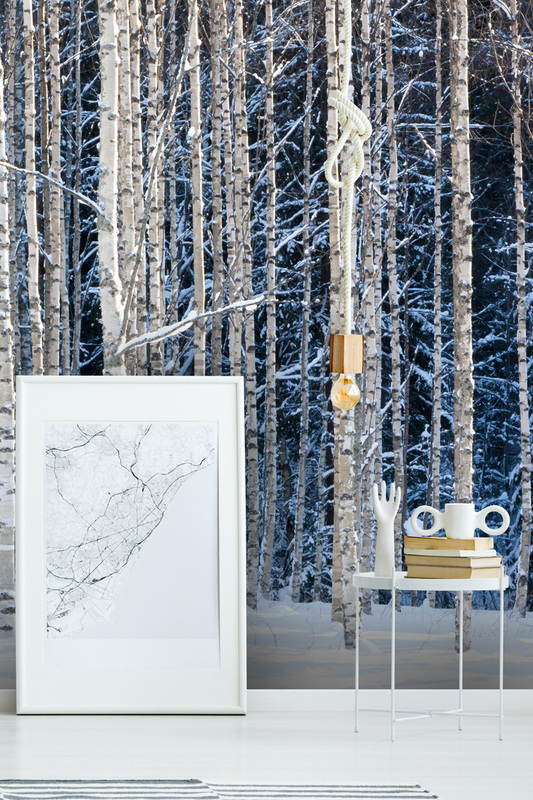 Our 'Snowy Birch Forest' wallpaper is a cool, abstract feature that can instantly transform your interior space. 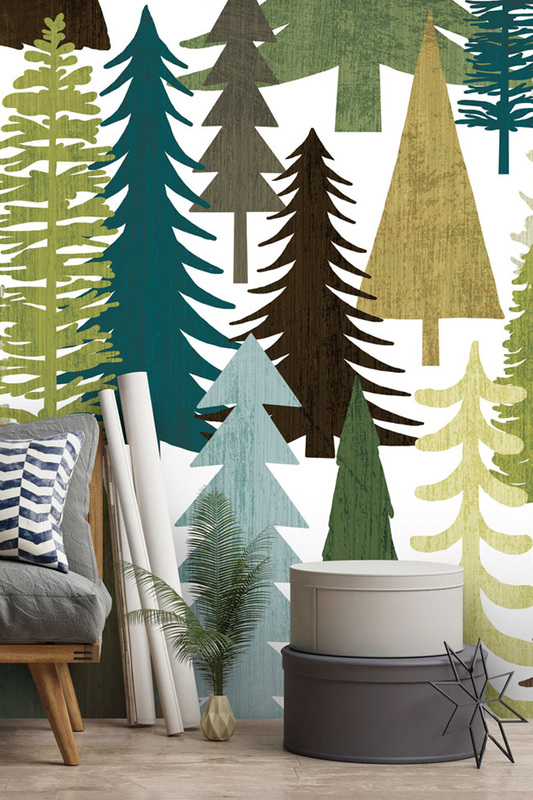 It’s a contemporary take on the forest theme, and we think it works best in a large room where walls feel bare. The stark trees are reminiscent of Christmas, yet this design looks just as good in other seasons. Giving you so many options when it comes to soft furnishings. If your friends and family are a bunch of creatives, they will love this mural. It works well in a minimalist setting, where it can be presented as the room’s single piece of art. Just as you would hang a beautiful painting on an empty wall, the space should be a blank canvas to let this artwork shine. The inspiration is stylishly Nordic, which is an on-trend choice for interior nerds, and fitting for the festive period. Decorate with a Norfolk Pine and some miniature fairy lights for an understated yuletide look. 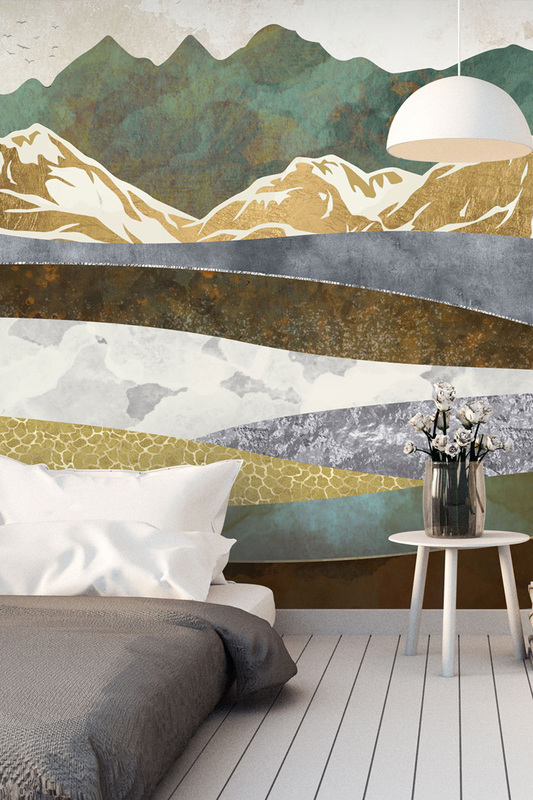 Our 'Winter Hills' wallpaper isn’t just for the colder season either. The Scandinavian style scenery can also channel the beautiful colours of spring and summer. Just add a chic eucalyptus bouquet and some gold decorative candles to warm up the room. When people think of Christmas, New York always pops to mind. There are fewer things more atmospheric than walking through Central Park at this time of year. Even for those who have never been, they’ll have watched all the movies (our favourites are Home Alone 2 and Miracle on 34th Street). Or if you’re a diehard Friends fan, the mural is just as fun and relevant. 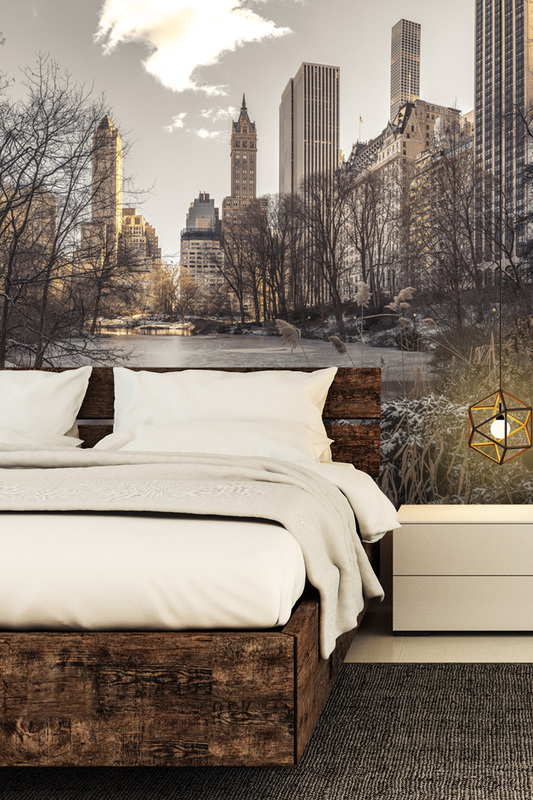 This exquisitely shot image, Winter Dawn in Central Park by Assaf Frank, is like a dreamy vacation every time you step inside the room. It’s the perfect guest room wallpaper for jet-setters or anyone who enjoys a bit of escapism. Leave room for a big Christmas tree in winter, and replace with a Ficus in spring to keep it transitional. Or keep plenty of blank wall space to turn it into a fully-fledged gallery with photography and art from all seasons. Our 'Woodland Trees' wallpaper mural provides a pretty backdrop for Santa’s workshop. But the muted greens and earthy browns keep it sophisticated and still grown-up. Keep the rest of the bedroom simple and muted, with a Poinsettia or some tinsel to let your guests know that Santa is on his way. Place a bowl of red and gold baubles on a dresser or bedside table against the wall, and you’ll have a contemporary deconstructed Christmas tree. 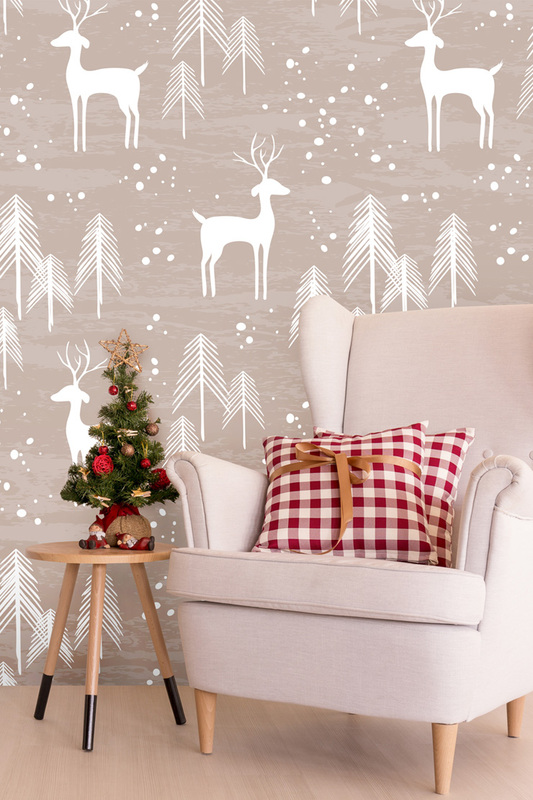 It’s the perfect festive wallpaper, but don’t be fooled by the wintry references in this mural. It’s more versatile than meets the eye, and is an adaptable feature throughout the seasons. You just have to know how to re-style the room come summer. Add a pop of colour, such as canary yellow, and the whole room will be transformed. We think this design is perfect in a guest bedroom for kids – they will love counting the cute reindeer on the walls as they doze off at night. 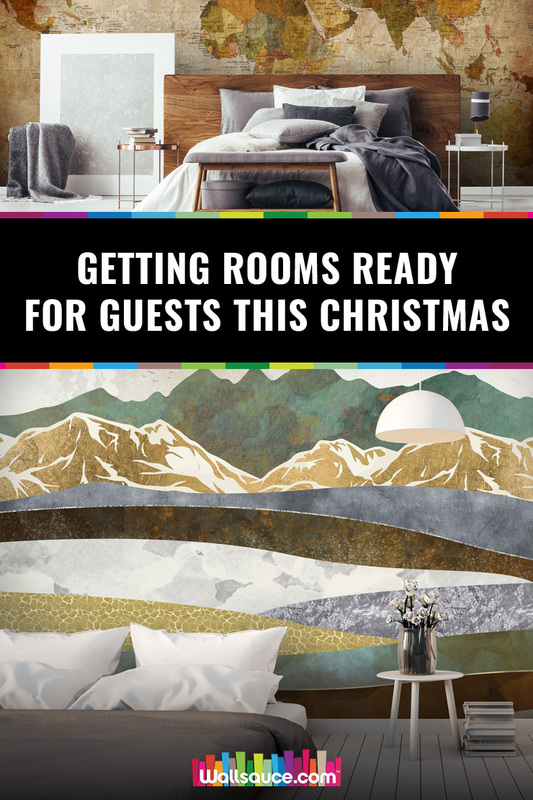 The wallpaper is very thematic, so it’s best suited for guestrooms or guest annexes that receive the most visitors at Christmas time. But with its muted colour scheme, the design can easily be translated into a Nordic piece of wall art. So your interiors don’t have to be limited to the month of December, and it won’t feel too novelty either. The ‘Nordic Noel’ trend is about adding splashes of red and green to a neutral area. Which means you can easily customise the space once celebrations come to an end. By selecting simple and elegant base colours and furnishings, you can keep the core concept of your room whilst swapping out soft decor like cushions. Our 'Deer in Winter' wallpaper is a match made in heaven for anything gingham, anything rustic, and anything shabby chic. 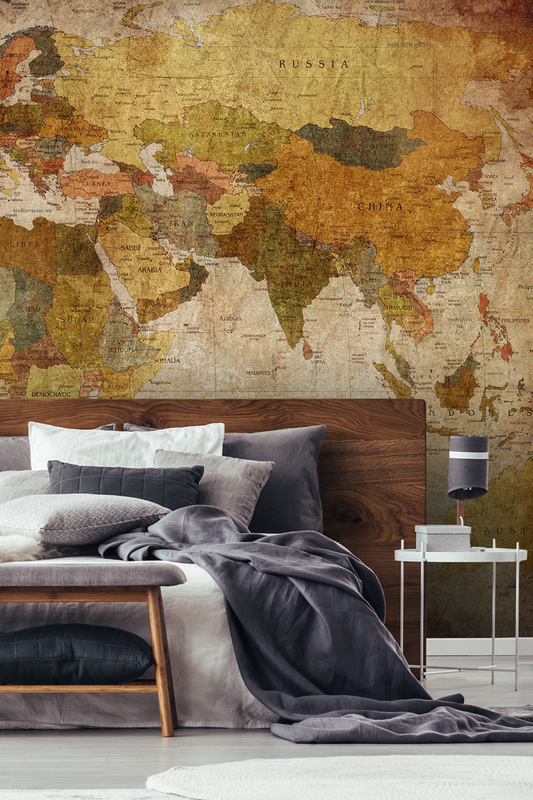 Don’t you just love the antique look of this 'Old Style World Map' wallpaper? Vintage themed rooms are always a big hit with guests. Not only for their timeless charm and intrigue, but also because vintage design is very much an unshakable trend. One that will always have relevance and popularity in modern interiors. With a vintage designed guest room, you can display interesting antiques, books and artefacts. Every unique piece can be a talking point, to make everyone’s stay memorable. World map wallpapers are also a creative way to welcome relatives from across the globe, which is one of the best parts of a Christmas gathering. You could even get interactive with the wall mural, dropping pins to show how far people have travelled. Stacking up some vintage suitcases or upcycling your own furniture would also be a very nice touch with this bedroom wallpaper. However you style it out, the room is guaranteed to have so much soul. For more ideas on installing map murals in your home, check out our recent post ‘How to Style a Map Mural’.